KZ is relatively new company in China that has started to make waves in the audio community for producing impressively performant in-ear headphones for competitive and in some cases very inexpensive prices. 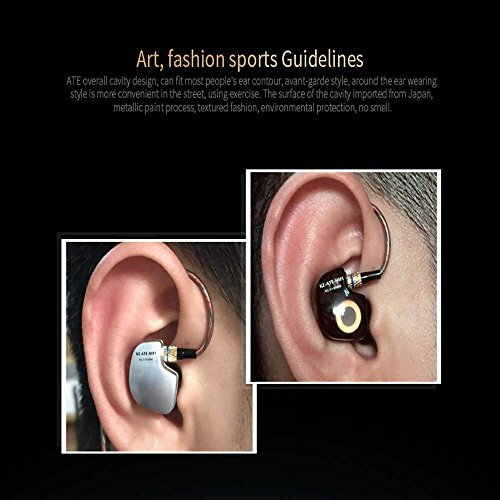 The now popular ATE (and ATE S “sport” version) is one such budget earphone. Packaging is basic but decent enough. The cover sleeve removes to reveal a hard open box, a plastic cover, and a contoured packing piece inside with the earphones firmly embedded in. The malleable foam tips were a little compressed and deformed on arrival, but reshaped fine once they were removed and could breathe. The wire wraps around and is simply twist-tied behind the packing piece along with the included accessories. The ATE’s fit is not intuitive and the generic instruction booklet had pictures of a different model that wasn’t quite the same, but after looking at a few stock photos I was able to figure it out – the wire is supposed to go horizontally forward then wrap behind the ear. 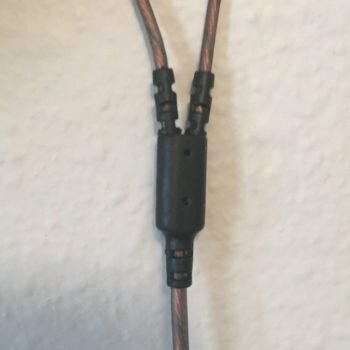 Wearing an earbud inverted and running the wire over the ear can be advantageous, and the ATE essentially forces you to do it. The ATE earphone is pretty large and bulky, and I couldn’t get a decent fit or seal with a rubber tip, but I could with the foam tips. The purpose of the gold joints about four inches down each left/right wire is, I think, to give them a bit of weight to hang down rather than bundle up around your ear/neck. 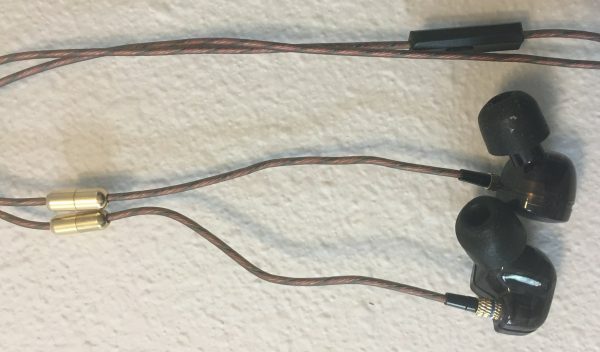 Other KZ headphones have a little plastic padding for going behind the ear, but the ATE does not. The bare wire isn’t the most comfortable thing, but it would be easy enough to use separate behind-ear pads with these. I also felt the gold joint on one side kind of annoyingly brush along my neck. Taking these on and off is a bit of an operation and wouldn’t be the greatest if you’re going to need to intermittently remove them. The wire is decently thick and sturdy. The outside insulation is kind of sticky and gummy though, which sort of hampered the comfort and caused it to get caught up on my clothing. Maybe that would go away with time and use though. Both the jack and angled support are nice and sturdy and plugged in securely to my device. 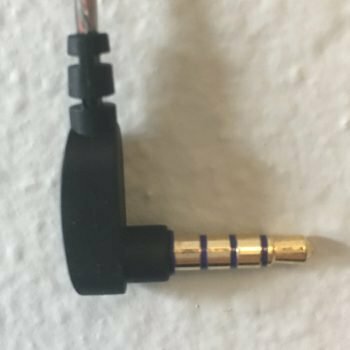 The ATE has a basic in-line mic along the right headphone wire with a single on/off call button. All in all, the ATE is decently built and sturdy and fits reasonably well with a bit of work to find the right tips, but is a bit of a hassle compared to a modern earbud that simply pops in and out. 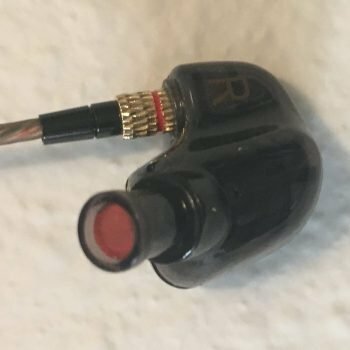 I first tried listening to these with rubber tips and the sound was noticeably thin and sibilant, and moving my jaw even slightly would lose the seal and essentially ruin the sound. However, when I changed to the foam tips both the fit and sound improved significantly. My general impression is that the ATE sounds very good for how cheap it is, but it has a specific style that some tend to dislike with earbuds (myself included). The ATE has the proverbial flat/neutral sound-signature. Reproduction is consistent across the range, and the detail and clarity is very good – you can really hear individual instruments clearly with separation. However, even improved with foam tips the mids/highs still had a bit of thinness, sibilance, and harshness. And rather than a nice full feeling that I personally like with earbuds, the mids, while they were often forward and particularly harsh, still had the sensation of emptiness, like the air was kind of getting sucked out of the middle, is the best way I can describe it. The issue I have with the IEM (in ear monitor) descriptor that these and other products have is that I’m never going to do any kind of actual monitoring with earbuds, much less inexpensive budget ones. That’s what I use something like the over-ear ATH-M40Xs (reviewed here) for. Rather, I’m using inexpensive earbuds for easy/commuter listening on the way to work, at the gym, etc. But, some people do really like this sound signature anyhow, and there are plenty of other according raving reviews. The bass on the ATE is definitely recessed. Percussions and beats are quieter and behind, and various drops I always test with headphones were quiet and underwhelming. The quoted response range is 15 – 20k Hz, which is above average for budget headphones, but there’s definitely some roll off well before that floor. The ATE has a 106 sensitivity rating and a 16 impedance rating, which means that pretty much any device will power these just fine and that, in theory, they should be able to get quite loud pretty easily. But, I had to crank the volume up more than normal to get them to an adequate listening volume. The ATE’s isolation is good – I’d put it somewhere between medium and high. The ATE has a one year warranty which is comparatively average for budget earbuds and in-ear headphones. 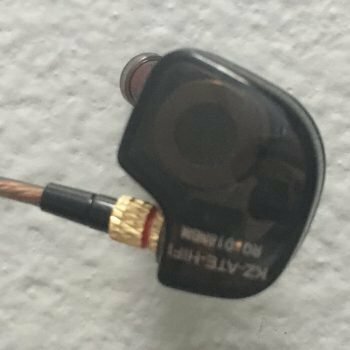 The KZ ATE is a very technically good sounding in-ear headphone for the modest price, but has a specific sound signature that some like while others might not. The response is very consistent and the detail, clarity, and separation is excellent. However, they’re bright up top, with mids/trebles that are a bit thin, sibilant, and harsh. The fit and comfort isn’t the greatest either and they’re a bit of a hassle to take on/off, though the sport version might be better for that.